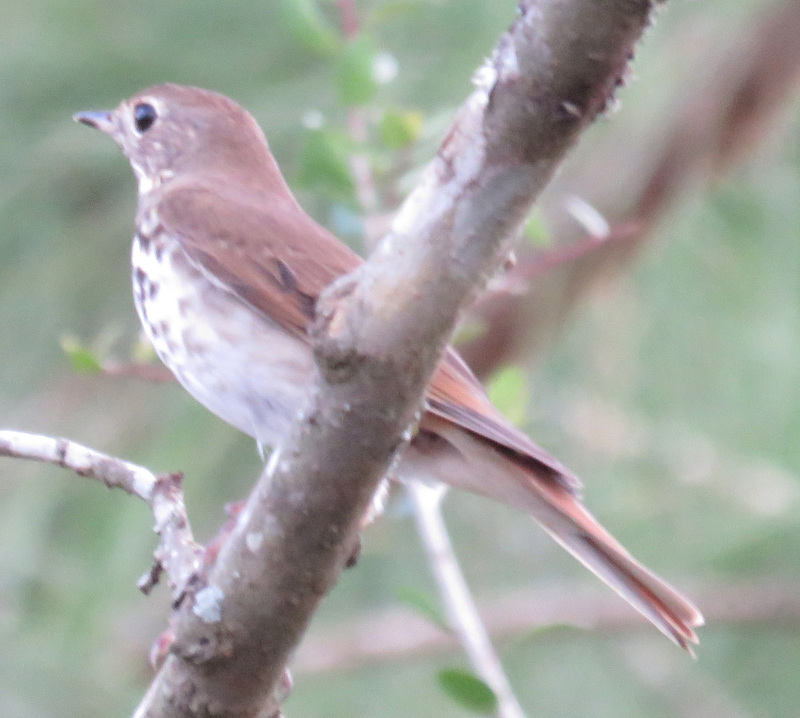 Bird species #87 for our farm — Hermit Thrush. 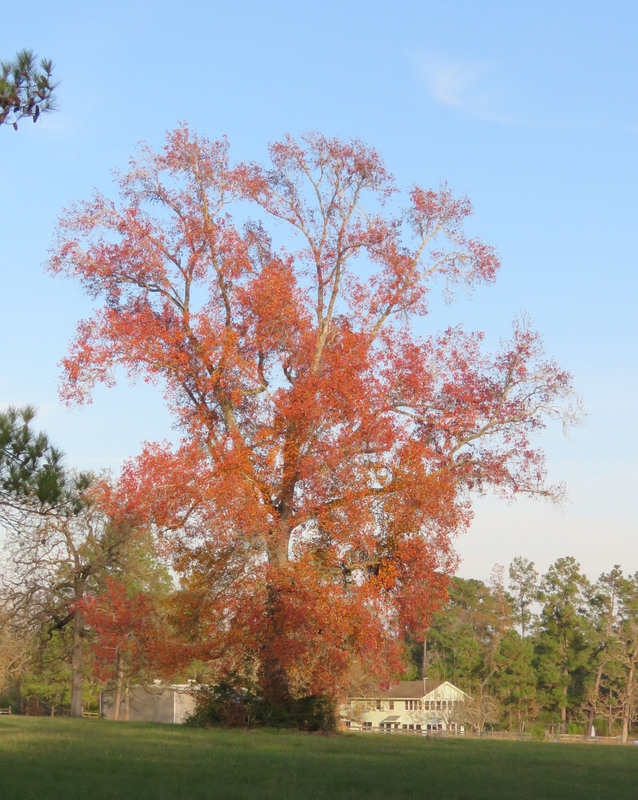 Belated fall color in a sweet gum tree. 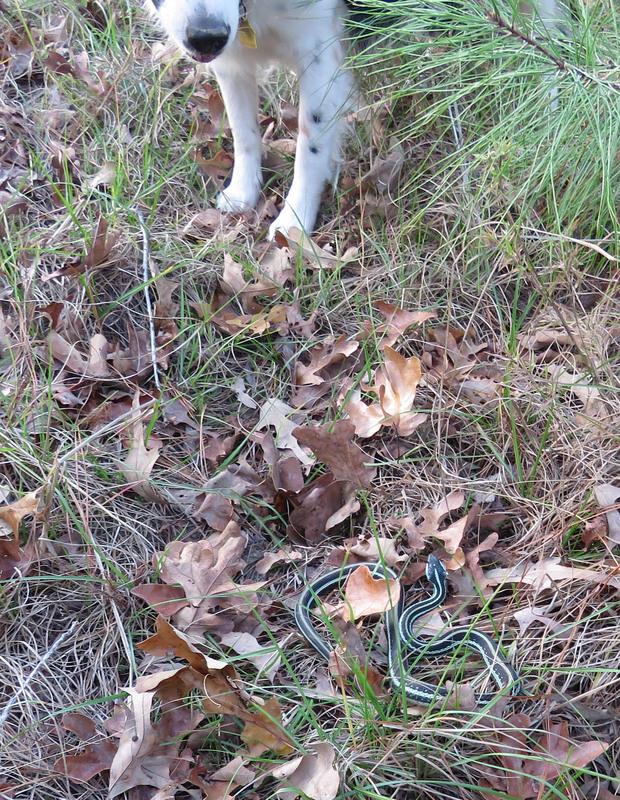 Harper finds a Western Ribbon Snake, who is not happy to be found. 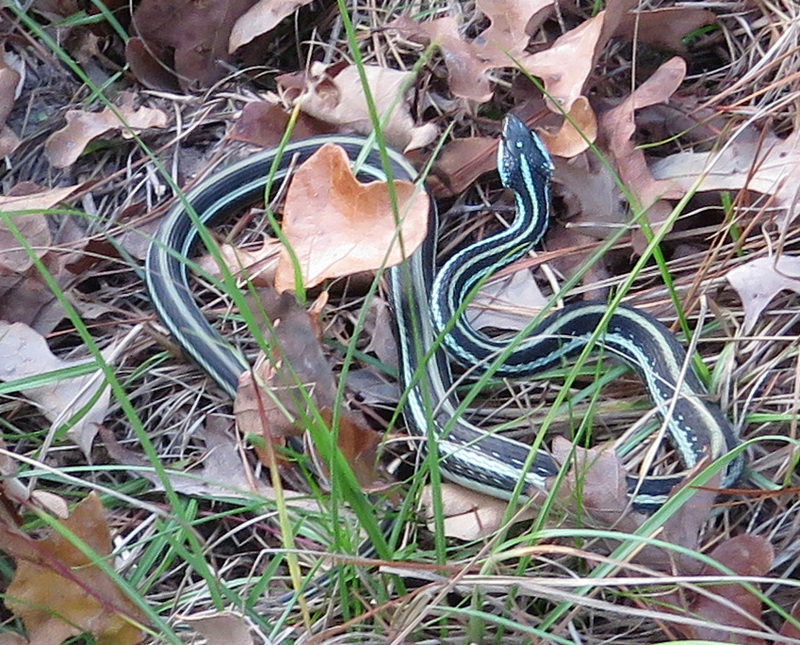 The snake — about twice as big as the one that was on the sidewalk near the house a few weeks ago. 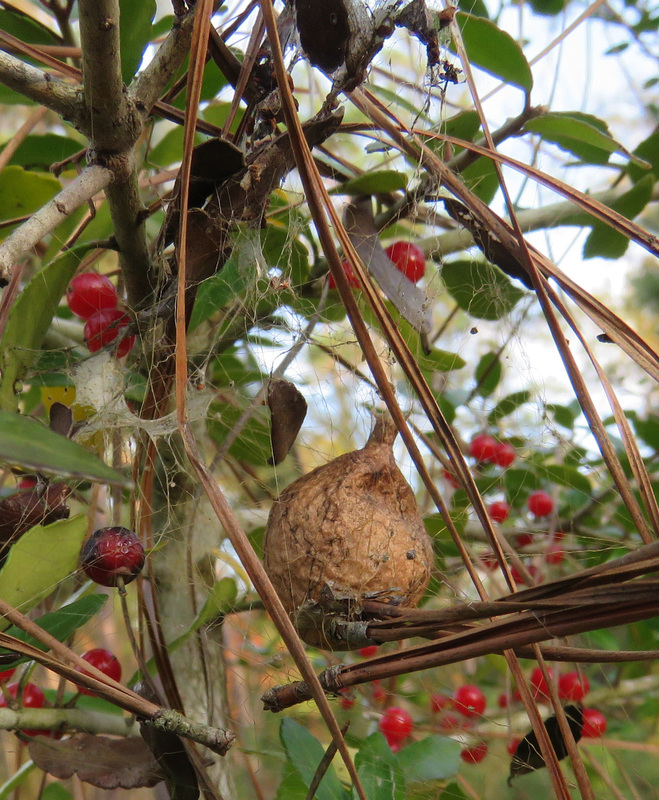 Spider egg sac in a yaupon shrub. 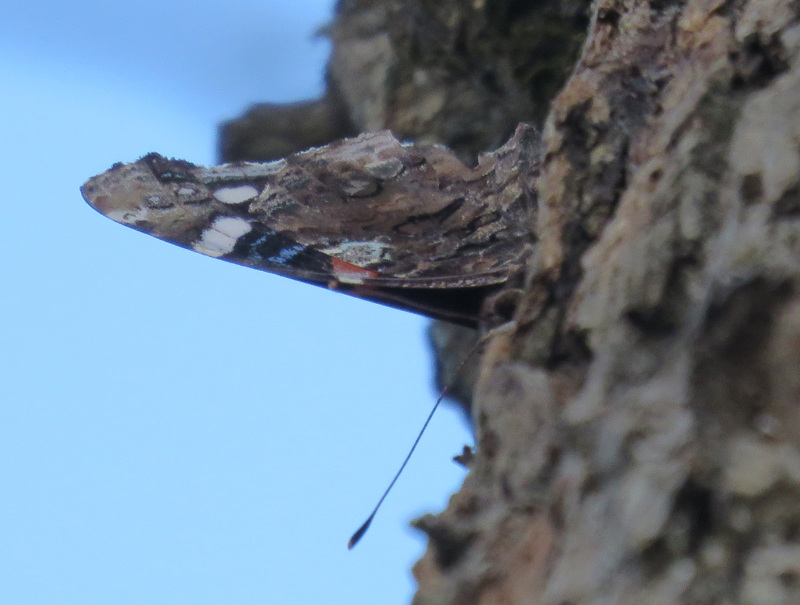 Two Red Admiral butterflies, as well as flies and wasps, were drawn to sap dripping from a sapsucker’s holes in an oak. This picture shows how well camouflaged the butterfly is. 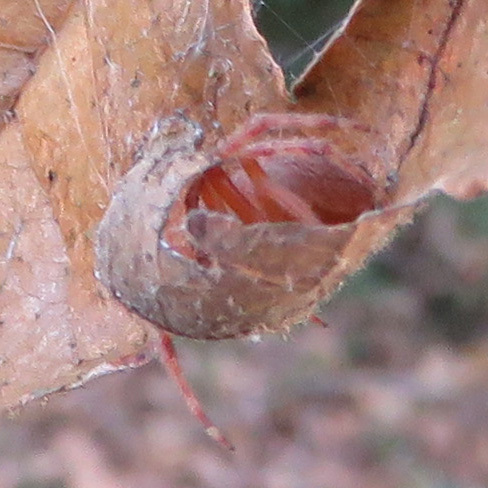 A small spider finds shelter in the curl of a dead leaf. 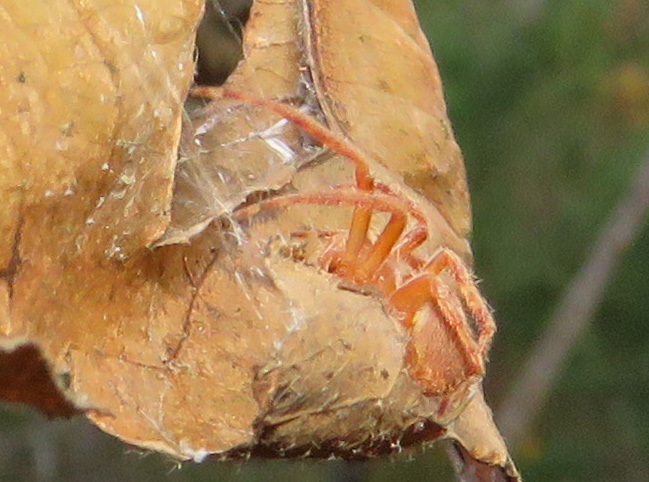 This spider was only about 1/4 inch long. 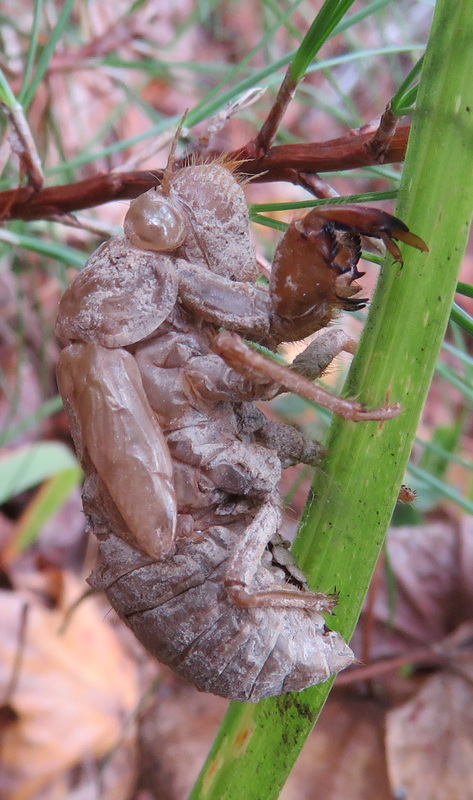 Hollow carapace of a cicada. Who knows how long it’s been clinging to this grass blade? 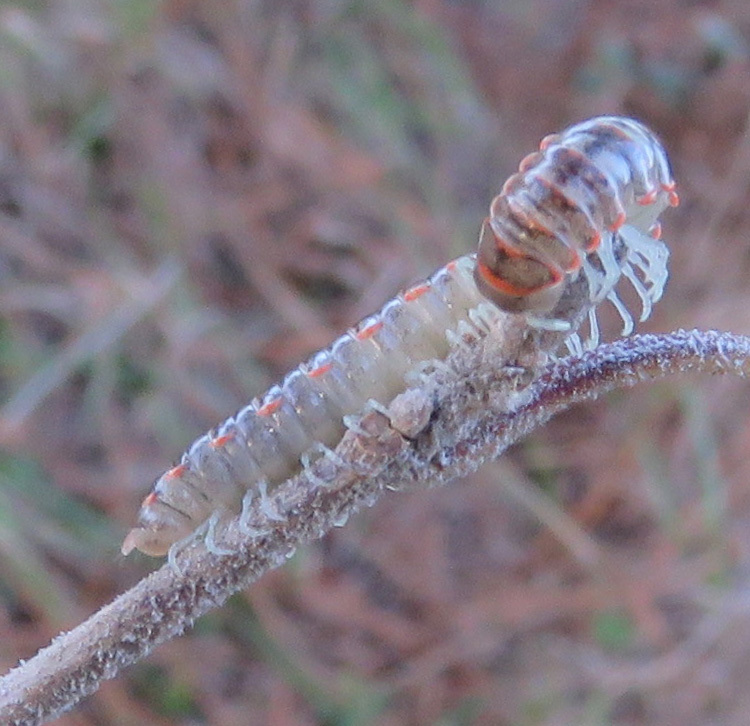 A young millipede at the end of a branch. All the leaves were eaten and I think I know who ate them. Calm stare of a Great Horned Owl. Notice that its back is facing us and it has turned its head around 180 degrees. All of these are from the last three days of warm and sunny weather. 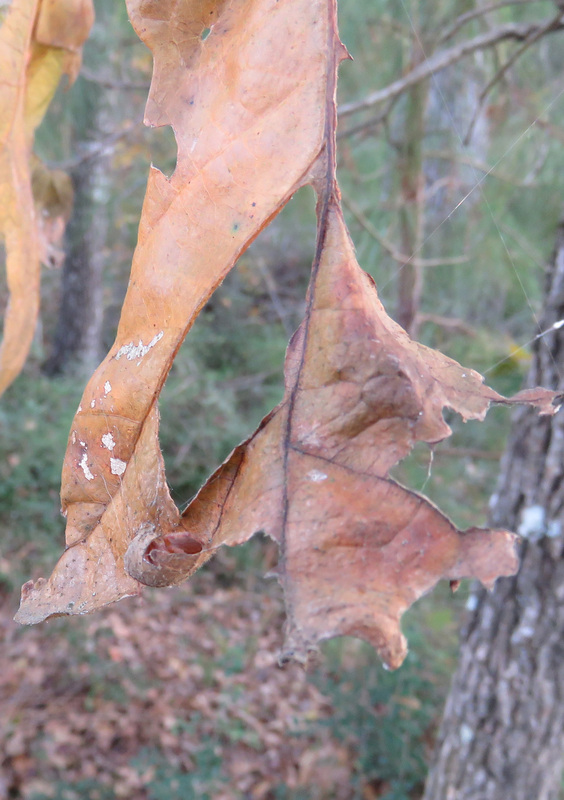 A cold front is supposed to blow in this weekend, and I am curious to see what changes it will cause in the wildlife. We love Great Horned Owl’s. Nice picture! Thank you! I was very glad to see this owl — for a while I was seeing a pair almost every day, and then several months had gone by with no sightings. I love the way they just look back at you for a long time, really unlike other birds. 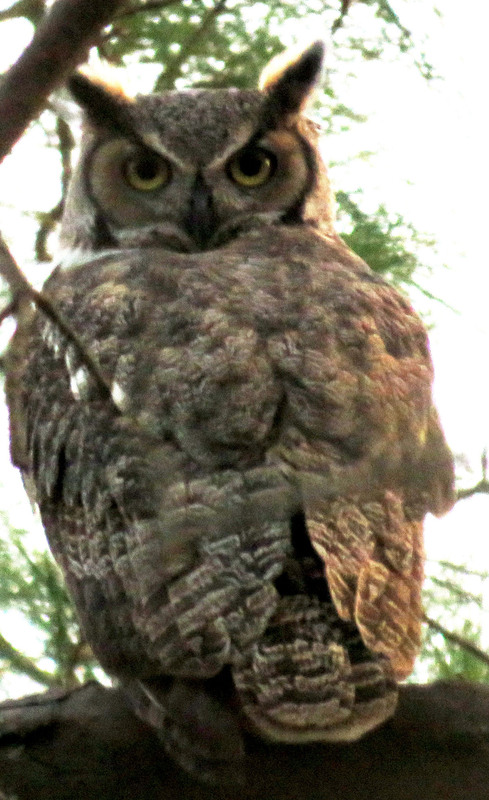 We have a couple of pairs of Great Horned Owls living in our area. And we know all about the look they can give you. They are beautiful birds. Oh, thank you, it is very nice to be associated with such a beautiful quote! Great photos. Is the sweet gum a liquid amber? We keep threatening to get one planted here. It is a beautiful colour. Yes it is! But I did not know that until you asked the question. They are native here and they are everywhere, and I have never looked up their Latin name, and I take tree workshops and I have never heard that name even mentioned! If you have enough room, it would be a good tree. 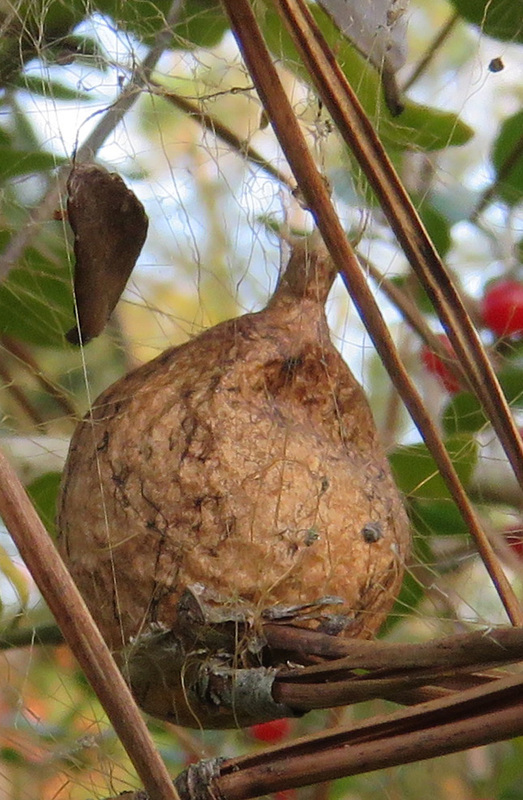 They do drop giant spiky seed balls every year, which can hurt bare feet or clog up lawn mowers. And the branches break and drop too. But the birds love the seeds and they are beautiful. We get so little fall color here that I treasure ours for that reason. Mr. Fairweather is a tree expert. I only know what I’m told. Think of putting it in an area we are sectioning off for pigs so we won’t worry too much about lawnmowers. And we have nothing here at the minute that would even compare with its colour.